In a recent article, we discussed how KEE (Ketone Ester Ethylene) roofing membranes can increase a building’s performance. Not only do KEE membranes increase a building’s stability, but the energy efficiencies and overall lifetime costs are also improved. I encountered a case from this past winter that addresses how utilizing a KEE membrane in extreme weather situations impacts performance. On January 24th, 2016, ‘Snowzilla’ hit the east coast, resulting in three feet of snow. It was considered a Category 4 winter storm and caused damage up and down the coast. 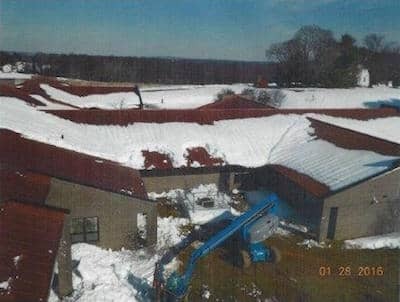 The Harford County School Board’s North Bend Elementary School, located in Jarretsville, Maryland, was one of the recipients of the harsh weather, suffering a partial roof collapse above the school’s media center. However, thanks to the KEE roofing membrane, which was installed in 2011, the roof was still able to perform and did not need to be replaced until after the school year was over, six months later. It’s important to note that the roof was only replaced due to the fact the structural components below had failed, not because the roofing membrane was compromised. The partial collapse was caused when wooden joists failed due to the extreme load on the roof. Ultimately, the heavy snow caused caving in the structural support for the building. In many cases, this type of collapse would have resulted in the entire roofing system being compromised or a total collapse. Fortunately North Bend Elementary’s KEE roof did not experience this result. The seams (and roofing membrane) remained intact, allowing for the roof to remain watertight and prevent any leaks that would have otherwise resulted from the melting snow. The roof was still intact and able to perform for a combination of reasons. The fabric contributed to the strength of the membrane and saved the roof from total collapse. The KEE top coat contributed to the roof remaining watertight throughout the winter storm and the months that followed. This was done in two ways. First, through waterproofing the membrane and second, the welded seam fusing itself into a total integrated bond. This seam did not come apart with the stress from the deflection of the deck and it also contributed to the strength of the membrane. After it was revealed that the roof did not fail, a few individuals on site made remarks about how the roof ‘must be metal.’ They were rather surprised when they found out that the roofing system was actually a simulated metal KEE membrane system, but that’s a discussion for a different day. So why was this KEE membrane able to withstand the load of the snow and continue to perform? KEE roofing systems differ from traditional roofs based on the fact that the membrane is engineered using a heavy base fabric instead of a scrim. This base fabric creates a much higher fiber content; more fiber means more overall strength. As a result, KEE roofing systems are able to withstand heavier loads than many other systems that are on the market. Have you seen success using a KEE roofing membrane? Share your experience in the comments.